Anyone know what kind of spider I have here? ~ by goatlady on January 23, 2007. Like what Google has done with the images search – image specs hidden, revealed on rollover. Nice and clean! Apparently they are “reluctant to bite” and not terribly poisonous. I dunno what he’s doing in our letterbox though. yes that is what it is – a redback is completely black – just watched Charlotte’s web at Burswood last weekend so spiders are currently ‘in’ in our household! Sorry guys, it’s not a Garden Orb Weaving Spider. The spider is in fact a Red back spider, juvenile, female, and has just moulted. (Thanks to the Pest and Disease Information Service @ Dept. of Agric for a quick answer). Kay, probably a good idea to get a heavy dose of bug spray on that before a letter gets sent to you. generally redbacks will not bite unless provoked, I guess sticking you hand into get the snail mail out can be considered as provocation! We had a wasps nest in our letter box and the postie left us a note saying that he will throw the mail on the driveway if we don’t clear the letter box. I was just telling Mattman yesterday we have spiders and wasps everywhere, we have just learnt to co-habit! Before you whack it with bug spray – how about trying a brush and pan and throwing it over the fence into the neighbours property? Ha, glad that’s sorted out! 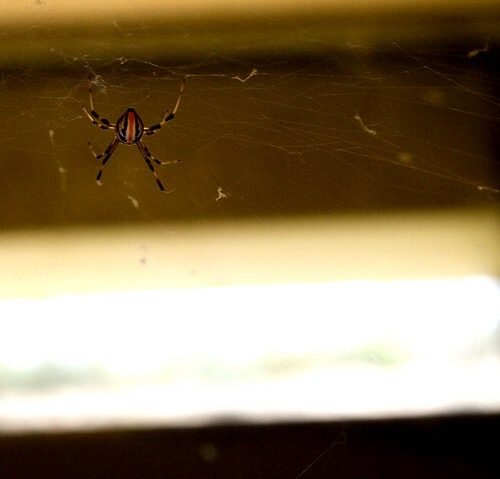 I did think Orb weaving spider for a minute too, but it’s shape was quite different. The spider chart is really Pascal’s, it should be next to his computer, ha ha!